Life is always exciting when you're a puppy! It's pretty exciting having the puppies around also. We have learned many things about the pups this week. Their coats are coming in nicely and we are better able to see which pups will be longer or tighter coated. The change in temperaments has also been amazing. Dominance in the pack, independence, curiosity, mischievousness, ease of handling...all of these things have presented themselves in the pups. 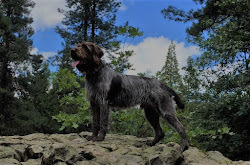 The great adaptability of the Wirehaired Pointing Griffon means a dog can take these traits and be a strong field dog as well as a loyal family pet. It's Hard to Be Neat When You're Learning to Eat!! This week the pups had their first introduction to solid food. And, like any true Griff, they were huge fans! Man, I'm behind! The puppies are growing like mad! 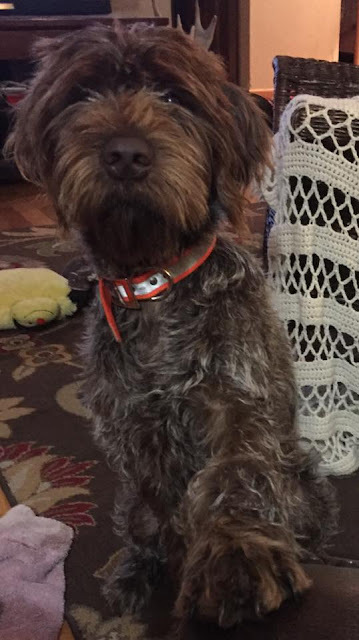 One thing that is absolutely consistent with the Wirehaired Pointing Griffon is that they love their people. The puppies are already barking at the door of the box as soon as they hear us walk in. There is nothing quite like instant celebrity status! The first week is behind us and it has been a great week! All of the puppies have been gaining good weight and that, on top of great birth weights, has given these pups a great head start. 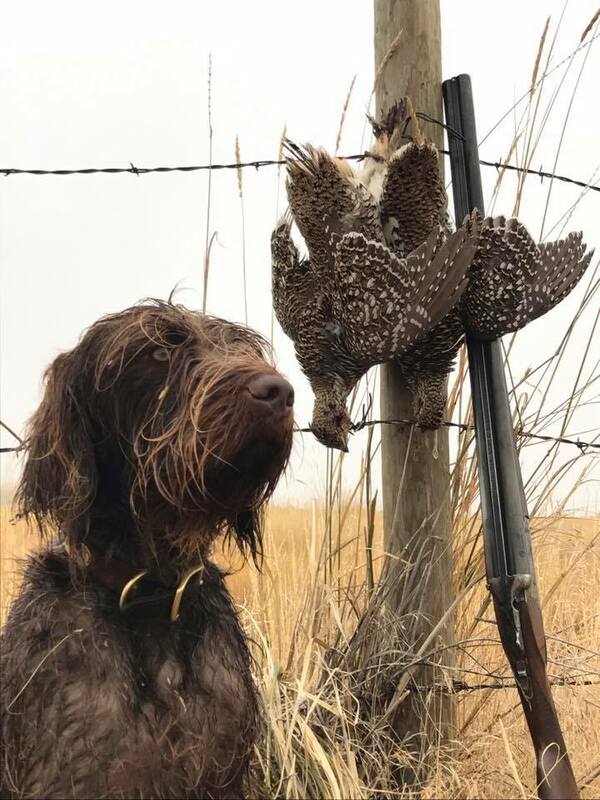 We have selected owners for all of these new bird dogs ranging from very young families to professional trainers and hunting guides. 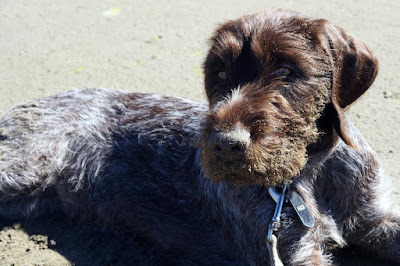 The wonderful adaptability of well-bred Wirehaired Pointing Griffons ensures that each dog, when placed in these situations, will exceed any expectation placed on them. We are thrilled for all of our new Giff owners! It has been a very long time since we've had good news here a Broken Bow. We have lost a litter and a dog in the last year, so nobody really had the drive to get online. Things haven't stopped around here though. One thing about a Wirehaired Pointing Griffon is their love of the field. We have had many great adventures. And this is our next. On Sunday night, Shai had 9 perfect puppies. Four girls and five boys. Our Puppy Daddy for this litter is Rex, HG's Versatile Rex. Rex is an incredible example of a Griffon. He has a harsh, dense coat, perfect lines and is a machine in the field. We have very high expectations for this litter. 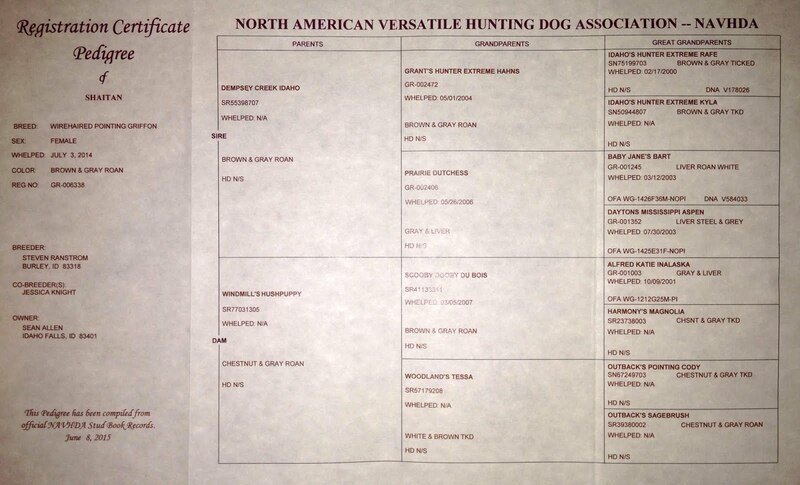 Both Shai and Rex have been tested with the North American Versatile Hunting Dog Association. NAVHDA holds dogs to a high standard, which is based on the original traits and tasks the breed was designed for. Rex scored a Prize 2 this year and last year Shai earned a Prize 3, putting in the highest score of the day under tough conditions. 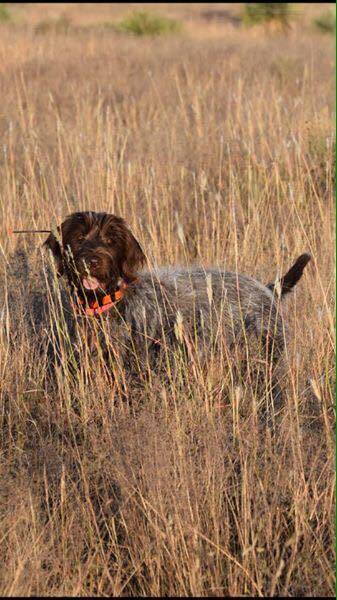 Rex has also begun work toward his conformation champion title, winning the advanced hunting dog sweepstakes this summer. These puppies will be finding new homes in December and we can't wait to watch them tear up the fields and duck ponds! We've seen some great things out of these pups. Most important to all of our owners, of course, is that they are in love with their Griffs! 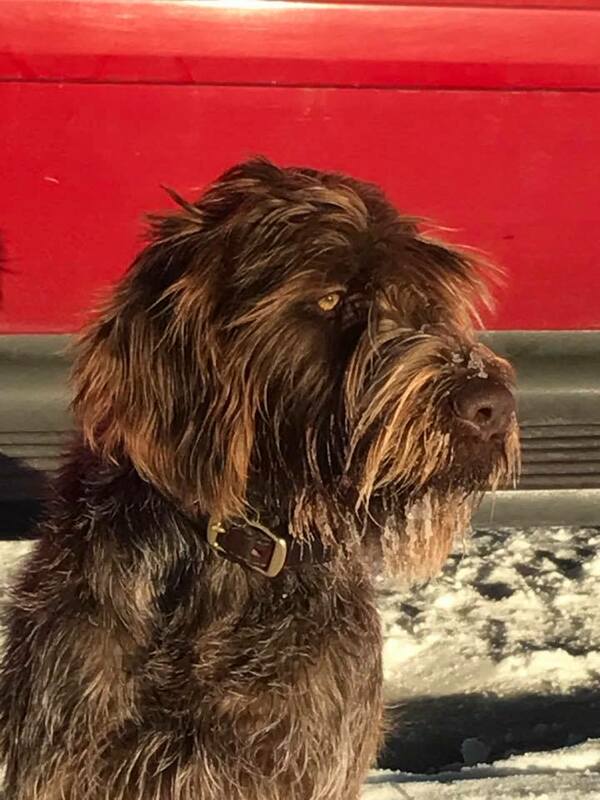 We are a small family run kennel in Southeast Idaho dedicated to raising AKC and NAVHDA quality Wirehaired Pointing Griffon puppies. 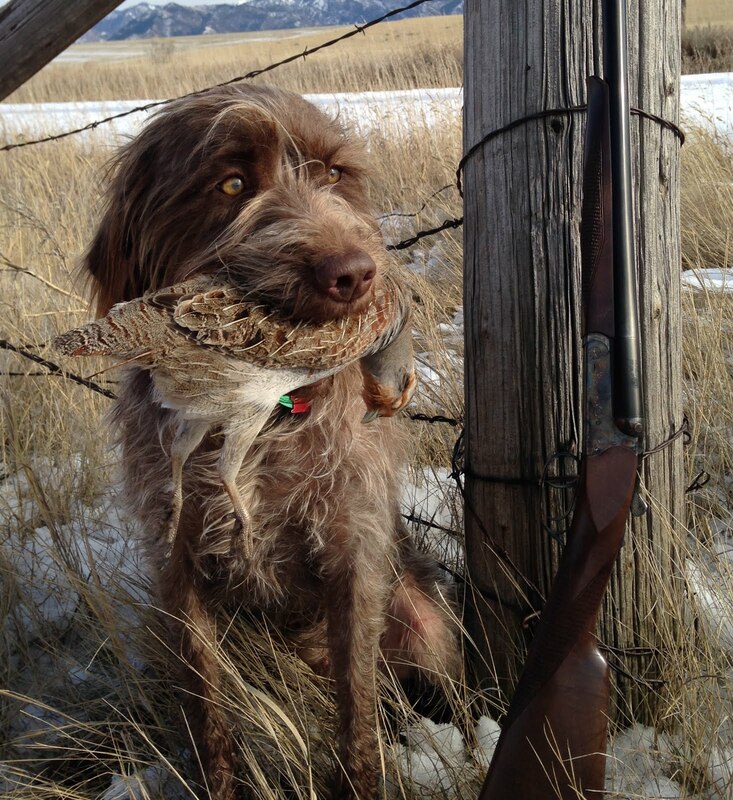 Our dogs are bred to ensure excellent genetic health, quality confirmation and a strong, natural hunting instinct. Also of great importance to us is producing a loyal family pet. All of our dogs are raised under foot in our home. We have 3 young boys who take the lead in socializing the dogs. We hold our dogs to a high obedience standard as well. 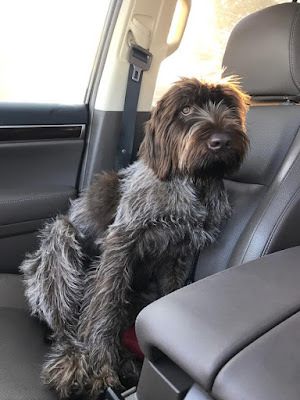 A Broken Bow puppy can be expected to excel in the field today and the show ring tomorrow. It's much less intimidating than it sounds. Because we are selective on the breeding of our dogs, we are also selective about the future homes of our pups. Our first recommendation is to contact us and have your name placed on our reservation list. We charge $50 for a spot on our list, which will be applied to your deposit once your puppy is on the ground and healthy. Next, and maybe more importantly, is to pay us a visit and fall in love with a Griff! All puppies are cute and you can't help having your heart stolen. Meeting an adult Griff is also an incredible experience. You will instantly note their intelligence and the bond that can be expected between a Griff and its people. As soon as we are expecting a litter, we will contact those on our list to confirm interest. We start taking deposits as soon as we have our litter in our hands.